I think that some of the people at WEG weren't familiar with the metric system. Maybe those lengths should be in feet, and then converted to metric? Or would that make them too small? Too small. Maybe they are in yards! This is Star Wars; there are no yards. Even if there were, the difference in length would be less than 2 meters for the sizes we're discussing. One meter = 1.1 yards, after all. Too small. Converting the WEG lengths from meters to feet would make these three shorter than a Honda Civic Sedan (15.23' long). In the past, I've always thought the Tramp Shuttle from the Rebel Alliance Sourcebook looked more like an airspeeder. From the official description of the Tramp Shuttle, it sounded more like the Star Wars equivalent of a [url=https://en.wikipedia.org/wiki/Technical_(vehicle)]Technical[/url], a civilian light cargo vehicle with some form of heavy weapon mounted in the bed. Despite wanting to make the official Tramp Shuttle into an airspeeder, the piece I was lacking was a good image for a civilian cargo speeder that could pedestal mount a heavy weapon in the cargo bed. And one more here, because stupid Wookieepedia refuses to allow image links. So I'm going to follow through on my original idea of making the Arrow-23 an airspeeder, carrying small teams of troops (air cavalry) alongside speeders, performing medevacs or light resupply, etc, and the motley collection from above will be examples of the Tramp Speeder, civilian light cargo vehicles modified with repeating blasters, light laser cannon, grenade launchers, etc, plus 3-4 troopers with guns in the flatbed. Okay, here is my version of the Tramp Shuttle from the RASB re-imagined as a utility airspeeder. I picture it as being similar to the UH-1 in Vietnam, able to be used for a wide variety of missions, from basic troop and light cargo transport to medevac and search & rescue. The version from the RASB with the turret is a modified version used as an air-cav mount alongside Alliance T-47s, able to put small teams of troops on the ground and provide them with heavy weapon support. I mean, if nothing else, have you ever wondered how they got Luke and Han back to Echo Base in ESB? There's no way there was enough room in Rogue Two's back seat for the two of them, especially with Luke banged up and frostbitten. I figure the T-47s used their superior sensors to locate them, then sent an Arrow-23 medevac airspeeder to haul them out. Description: This variant exchanges 50% of the Arrow's transport capacity for enhanced sensors and a dorsal weapons turret. It generally carries a four-being fire team, generally lightly armed scouts or skirmishers or heavily armed assaulters who take and hold ground for follow-on infantry units. *Both weapons are coaxially mounted in the same turret and are controlled by a single gunner. And here is my version of the Tramp Speeder, as it would stat out with the vehicle images I posted above. Think the SWU equivalent of a full-size pickup truck, modified for greater speed and off-road handling, with a machinegun in the truck bed. And a cooler full of chilled lum, a multi-tone airhorn and a gun rack in the cockpit. A Tramp Speeder is a general class of civilian light utility landspeeder, and not a specific make and model. 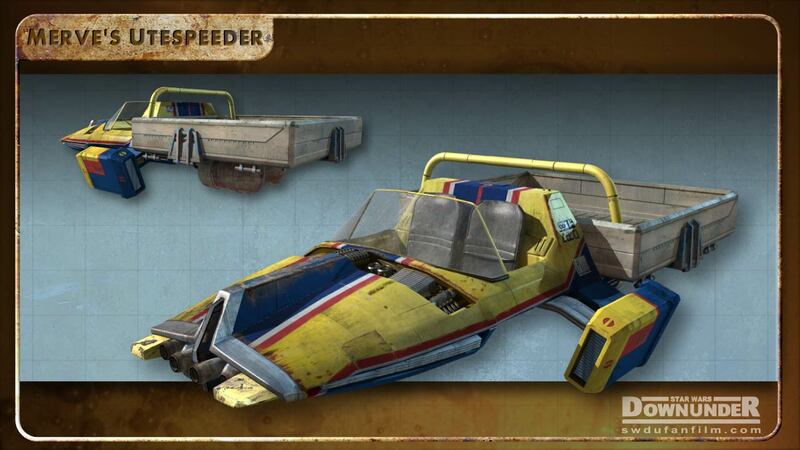 Most speeder companies build and sell some variant on the theme, calling it a utility speeder. 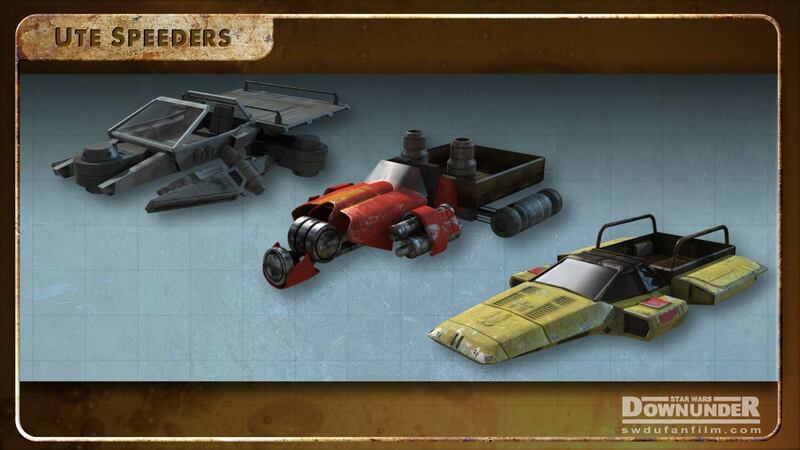 Tramp Speeders are a particular sub-class of utility speeder, generally noted for both their run-down appearance and their rugged toughness and versatility. Tramp Speeders are not intended for combat, but are commonly pressed into service by irregular forces, including the Rebel Alliance. This is where their versatility shines through, carrying in urgently needed supplies (energy cells, ammunition and medpacs), carrying out the wounded or, in many cases, serving as mobile support weapons platforms. Cargo Capacity: 5 passengers or 1 metric ton in cargo bed. Other possible mounted weapons include light laser cannon, grenade or missile launchers, and even mortars. Tramp Shuttle from the Rebel Alliance Sourcebook looked more like an airspeeder. I've always used this as an airspeeder. I simply increased the flight ceiling. The name "tramp shuttle" is a misnomer and should be changed. Shuttles in Star Wars are and should be vehicles or ships that can at least reach orbit to shuttle passengers and supplies from ground to ships or stations in orbit. I would think many shuttles are capable of in-system, interplanetary travel and clearly some shuttles, like the Lambda Shuttle, are even equipped with hyperdrives. 1) a person who travels from place to place on foot in search of work or as a vagrant or beggar. 2) a cargo vessel that carries goods among many different ports rather than sailing a fixed route. I think my concept of a run-down, civilian "pickup" speeder pressed into combat service fits with both concepts. I just never felt like the Tramp Shuttle as shown really embodied the concept. Shuttles in Star Wars are and should be vehicles or ships that can at least reach orbit to shuttle passengers and supplies from ground to ships or stations in orbit. I would think many shuttles are capable of in-system, interplanetary travel and clearly some shuttles, like the Lambda Shuttle, are even equipped with hyperdrives. The theory I'm working with on the altitude limit for airspeeders (~50km per WEG 2R&E) is that airspeeders derive power from a miniature fusion reactor that is, in turn, force fed by atmospheric intake. Air scoops draw in a planet's atmosphere, concentrate and filter it, and then use it as fuel for the reactor, which in turn provides thrust and lift (via repulsorlifts and turbine boosters) as well as power to the systems. However, at roughly 50 kilometers up (on an Earth-type planet; other planets, particularly gas giants, will have a much higher relative usable altitude), the atmosphere becomes too thin to usefully concentrate. Larger speeders like cloud cars carry onboard reserves that allow them to operate up to low orbit, but lack the proper shielding to go beyond the planet's radiation belts. So, small speeders like the T-47 and Arrow-23 can pop up to low orbit for short periods of time (such as, long enough to launch from or land on starships), but can't operate there for extended periods of time, while larger vehicles like the Storm IV, the LAAT-series ships from AOTC & Clone Wars, and the Poranji Orbital Jumper (Cracken's Threat Dossier; Black Fleet Crisis section) can operate in low orbit so long as they have consumables available to do so. I also separated open-top airspeeders into a separate class called Skimmers to represent their inability to operate above 3-4 kilometers due to the lack of environmental protection for their crew/passengers. Airspeeders speed through the air. It's right there in the name. Low Earth Orbit seems to run from about 100-1200 miles up so a 50KM ceiling is way too low to shuttle to and from something in orbit to the planet. Space ships in Star Wars are ubiquitous in the galactic culture and have myriad designs. Much like ocean going craft in the real world and a little bit like aircraft in the real world. We see in the EU and in WEG materials that tramp freighter refers to light freighters like the YT-1300. Given the meaning of real world sea borne craft denoted by the phrase tramp freighter using the same phrase for Star Wars light freighters makes a lot of sense. Shuttles in the real world get used for short, frequently made aircraft flights like the NYC/NJ to Washington DC shuttle or the bus that takes you from the airport where the DC shuttle landed to your airport. In DC. Given all this, the phrase tramp shuttle applied to a landspeeder doesn't make any sense to me. Applying the phrase to an airspeeder doesn't fix the problem in terminology. Just call the landspeeder or the airspeeder that performs that role a speeder bus and have done. If you go back and look, you'll notice that I didn't actually use the phrase "Tramp Shuttle" in either stat. One was renamed the Utility Airspeeder, the other was called the Tramp Speeder. And just because it's common for ships to be space-travel-capable in the SWU doesn't mean that they all should be. If nothing else, cost and complexity dictate that less expensive vehicles will be developed to serve less strenuous requirements. A lot of what I'm doing here is an attempt to balance out WEG's classifications and descriptions with rational explanations as to why certain limits are set. The closest thing there is in the real world to a 50-kilometer limit is the Karman Line (thanks, Zarn), the point at which air gets too thin to provide lift when passing over wings. However, in a universe where anti-gravity tech is commonplace, there is no need for wings to provide lift for air-breathing craft, so there has to be another explanation. Considering this point is where my air-scoop concept came from; it provides a rational explanation for WEG's decision to cap airspeeder altitudes at 50 kilometers. So, per the Star Wars Technical Commentaries, WEG shorted the dimensions of the AT-AT. When I re-did the stats, I used the SWTC numbers instead of WEGs. But this leads to something of a problem in that there were other vehicles which used the AT-AT (a known quantity from the films) as a measuring stick in the scale drawings in the various sourcebooks. In particular, the Juggernaut was listed as being 21.8 meters, only 1.2 meters longer than WEG's 20.6 meter long AT-AT. However, if the AT-AT jumps up to 26 meters in length, then the Juggernaut needs to be at least 27.5 meters long. And then the films didn't make it any easier when they made the A6 Juggernaut almost twice as long (and presumably increased the other dimensions by a similar increment). I'm okay with leaving the dimensions of the Floating Fortress as per the WEG stats, and I'm on the fence about the Mobile Command Base, but I definitely want to change the length of the Juggernaut; either increasing it in proportion to the AT-AT's altered length, or just making all of them as big as the ROTS -A6 Juggernaut. Thoughts? Floating fortress i can see upping its size, as its iirc supposed to be almost as long as an AtAt, just without the head/neck/legs, but the juggernaught is right size imo. Based on what? The only concrete indicator we have that the Floating Fortress is the same size as the AT-AT is the scale drawing found in the ImpSB, where the Juggernaut is actually slightly larger than the AT-AT. If you're going to advocate one being larger, but not the other, then the Floating Fortress, with its low troop capacity (10, as opposed to 50) and its mission (urban operations, which generally translates into pretty tight quarters) make it a much better candidate.